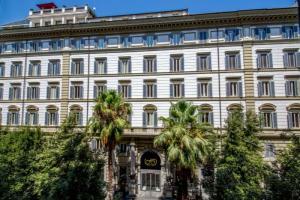 The Hotel SAVOY Roma is housed in an aristocratic palazzo dating to the late 1800s. This historic hotel was was named after Queen Margaret of Savoy who, in the early 1900s, chose it for her Roman sojourns. The hotel is ideal for those wishing to stay in the center of Rome surrounded by the atmosphere of the dolce vita of Via Veneto. Each of the hotel's 124 guest rooms is beautifully and uniquely furnished in a classical style, welcoming guests into a discreet and elegant environment. Located just 12 miles from the Ciampino International Airport.